I never get tired of wearing jeans and heels! This time I replaced the boyfriend jeans, my No.1 favorite, with wide leg denim and I paired them with more than one print. 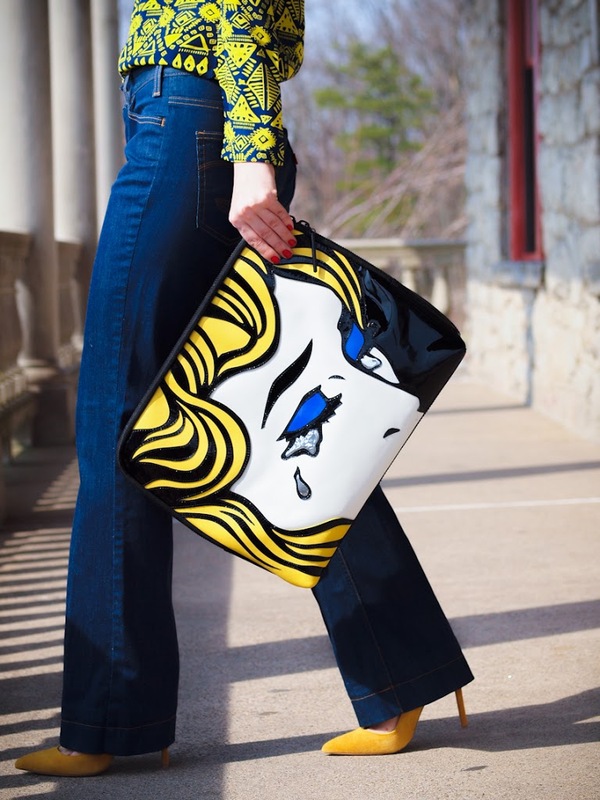 A spin of Pop Art is always so refreshing no matter if you are wearing classic pieces or modern ones. An artist always loves wearing art pieces ! Oh, I love that necklace!!!! You look absolutely adorable and stylish!!!! I LOVE this top..the shoulders make it special and the necklace goes perfectly! Did you know you were in the NY Times Street-Style section? I am there too, right after you! This necklace is SO dang awesome!!! I love it with that printed top. Fabulous look. Love that top, it’s gorgeous! Totally love these colors!! Gorgeous look! Your DIY necklace is gorgeous ! And I love the whole outfit ! I love love love this bag!! So amazing!! Wow, this outfit is ridiculously beautiful! That top is amazing and IN LOVE with that clutch. You look amazing! My, what a cool necklace! absolutely stunning, im loving the print on that blouse!!! love shape of your jeans! Adore this look! One of my favourites for sure! Adore this look so much! one of my favourites for sure! So simple & chic! How not to love some gorgeous and amazing prints!? Even more, when mixed so perfectly! just perfect! 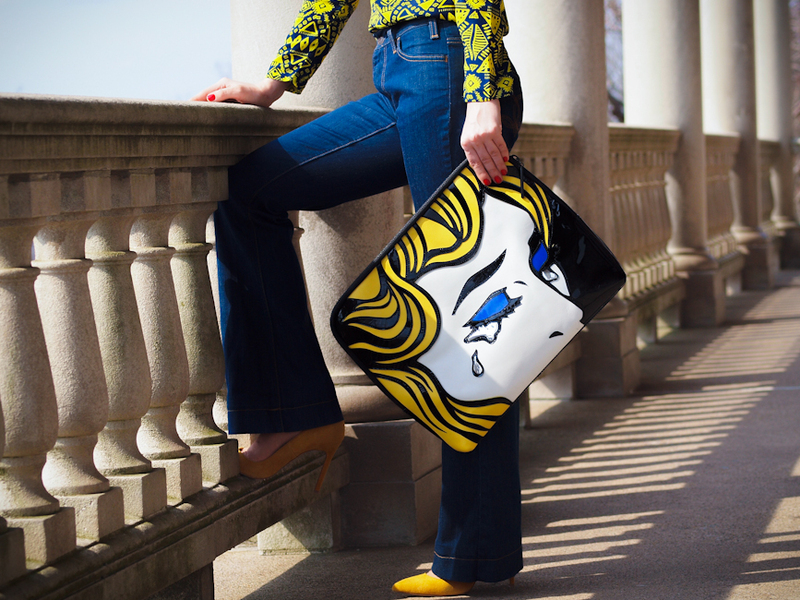 The top, jeans, clutch… everything! Love this!! This is one of my favorite looks wide leg flair with chic sunnies and heels! Love the top.. it’s killer! Love the complete outfit! The necklace is amazing! Love the top and necklace! it’s a pure magic! You look amazing! absolutely stunning!!!!!!!!! Loving every detail!!!! Love your style!! always perfect!! Absolutely fabulous! Love the colors, love the prints, LOVE that bag. Great look with perfect styling. Love it! Fantastic outfit and very interesting necklace. Now that’s a statement necklace! Love it! !